Well the time has finally come! The world’s largest cruise ship is ready for action. 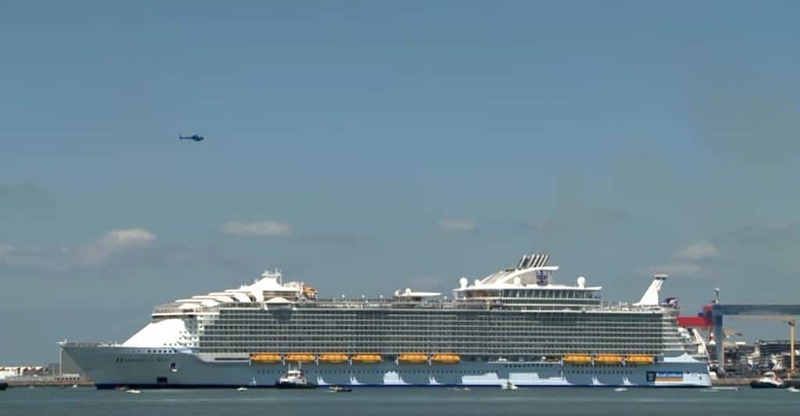 Royal Caribbean has wasted no time in putting their new mega ship into the lineup. Let’s see what the Harmony of the Seas has in store for its 2016 season. Harmony of the Seas is on its way to her maiden voyage, after departing from the shipyard in France. The ship is scheduled for arrival at Southampton on Tuesday May, 17, from there the ship will make its inaugural passenger voyage on May, 22 to Barcelona. Barcelona will be the ship’s home port for the mean time. Royal Caribbean is more than excited about the new addition that will be the 25 ship added to their fleet. President of Royal Caribbean Michael Bayley had some choice words about his record-breaking ship. The 227,700 ton Harmony of the Seas has a total capacity of 6,410 passengers. The worlds largest cruise ship was built by STX France in Saint-Nazaire, France. Cruise Hive previously reported on the world’s largest ship and the vessel state of the art features. In November the ship will be in Fort Lauderdale, Florida to join her sister ships, Oasis of the Seas and Allure of the Seas. Both ships where previous record holders of the world’s largest ship.